Hostombe Properties Apartments Barbados are privately owned beachfront penthouses located on the west coast. Whether you are booking a cosy romantic break, an adults only vacation, or an exciting family holiday, our beachfront apartments are perfect for you. Please have a look at our wonderful properties and contact us to check availability and prices. Our love of Barbados and its people goes back to 1975 when we spent our honeymoon here on the west coast, and since 1991 we have returned each summer with our daughters and their friends for fabulous & memorable holidays. 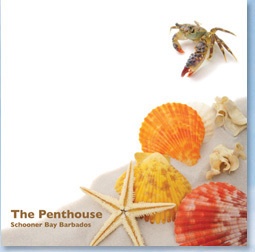 Having stayed in villas, hotels and apartments, we are very excited now to be here at Schooner Bay with two amazing penthouse apartments both aptly named "The Penthouse" and "The Lookout". The flexibility of penthouse life is particularly enjoyable as there is such a wide choice of good food available in Barbados. There are excellent restaurants all down the west coast, as well as many low key 'chilled' ones - several are within walking distance. We frequently use our rooftop barbecue (after cocktails in the spa pool) or employ a chef to conjur up a delicious meal in the fully equipped kitchen. Our properties are located in the Parish of St. Peter on the famous Platinum coast. The historic town of Speightstown is just a few minutes walk away by beach or road on the north side. 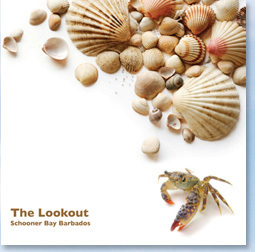 Schooner Bay is situated well away from the main road and is a secure gated community with beautiful gardens and a large freeform pool (including a shallow area ideal for children). Go scuba diving, fishing, sailing or waterskiing. Play golf at the world famous courses at Sandy Lane and Royal Westmoreland or Apes Hill. Watch the polo, cricket or horse racing. Swim and snorkel in the bay next to the apartment. Wind up the day with cocktails on the beach as you watch a beautiful sunset. Explore the island or lie in the sun ....... the choices are endless! We hope that this and the information which follows will encourage you to stay in one of our excellent apartments and share the delights of this beautiful island.